The Alsatian Resort & Golf Club features a well-groomed 18-hole golf course. It’s just about that time for many RVers to start thinking about heading south. Though given the dismal weather on the East and West Coasts of the United States, a safe bet is Texas. 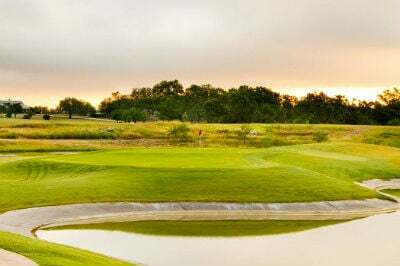 Just west of San Antonio – a popular Texas snowbird destination – is Castroville and the luxury Alsatian Resort & Golf Club that features an 18-hole golf course. The amenities are first class and many RVers have been frequent visitors to Alsatian over the years. One of the many things they appreciate about the park is the spacious sites available. Featuring 69 over-sized pull-through sites, Alsatian is a dream resort for visitors with big rigs. Other amenities on the 156-acre property include The Serenity Spa. This is where golfers can soak in the Jacuzzi or revitalize muscles with a massage after a round. More notable activities at the resort, visitors can fish, swim, or go bird watching and enjoy nature trails. Additionally, the staff at Alsatian Resort offer guests free wine tours to local wineries for groups of six or more. Also, visitors will appreciate the popular pavilion. This outdoor living room has a garden setting where guests can enjoy live music and cocktails. What’s more visitors can reserve the area for special events or gatherings. While there are plenty of activities, the 18-hole Alsatian course at the Alsatian Golf Club stretches to 6,436 yards from the championship tees. The par 71 course is a Steve Marak design and was ready for play in 1995. In addition to the golf course, other features of Alsatian Golf Club include a 21-stall hitting bay and driving range with practice facility. After playing a round, relax at the Dagger Grille. With a good menu for food and drink, you can enjoy five big screen televisions in the clubhouse. Further, history buffs will appreciate the town of Castroville, which was settled by emigrants from the Alsace area of France, hence the name, Alsatian Resort. As a result, Chateau Lafayette is worth a visit. This quaint antique shop offers gourmet items, specialty cheeses, along with meat and venison sausages, plus imported sweets and chocolates. Nearby, Haby’s Alsatian Bakery specializes in homemade bread, pastries, cakes, pies, and cookies. Most of all, for those needing more action or shopping, plan a mission to San Antonio for shopping and to visit the famous River Walk just 30 minutes from Castroville.